There’s a great new resource for collaboration as communicators! …an online space where photos, videos, templates or samples, links, and more can be shared in a keyword searchable format. Not only that, but where collaborators can rate these shared resources so that collective user reviews can automatically identify and curate popular resources. 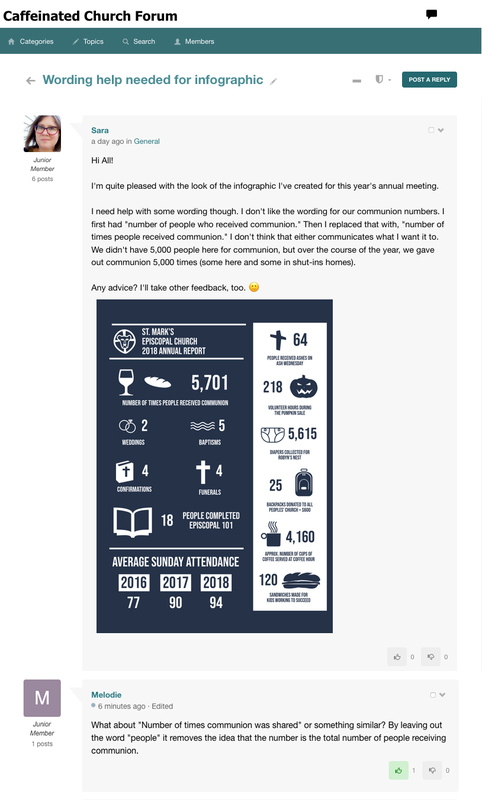 The new Caffeinated Church Forum can host discussions around unlimited topics and share files and resources; everything from photos and videos, to Word documents, to PDFs, to InDesign files, to Photoshop files, to Publisher files, and more! A powerful search feature also allows communicators to research the forum via keywords and topics, along with by popularity, date, category, and author. The forum is mobile responsive as well for on-the-go usability. Additionally, posts and ideas can be easily shared to Facebook and Twitter. Files up to 50MB are allowed on the forum! Even better, you can control emails (similar to a talk-list) in your profile settings on the forum to receive emails immediately, daily, weekly, or never. But wait, there’s more… you can simply reply to an email and it will be added to the topic thread. It’s like a talk-list on steroids! Joining the Caffeinated Church Forum is simple! Just visit CaffeinatedChurch.org and follow the prompts to sign up. It takes just a minute and you’ll be all set to share, ask questions, and be a fellow collaborator on the forum!